When will internet kill the traditional TV? This statement belogs to Terence Kawaja from Luma Partners, one of the most respected US investment banking companies (specialized in media, digital and tech. Luma is also realizing that the famous “landscapes” (probably the most “stolen” slides from the specialized events industry). I’ve met Kawaja at DMEXCO in Cologne (and, with a bit of luck, maybe I will convince him to come to ICEEfest in 2016). He is one of the best “equipped” (with logic and data) people that I have listened to and, considering he is an investment banker, it is almost shocking to see that he understands the digital and tech industry better than many of those working in the very sector. 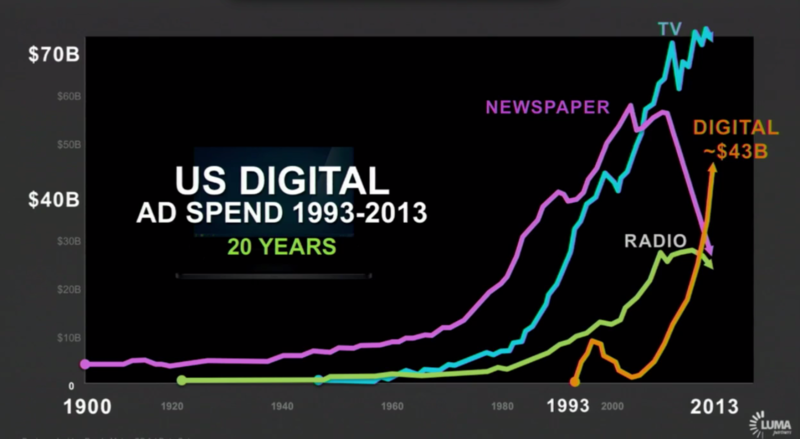 That is why the presentation “The future of (digital) TV” is worth the time investment. You can find it below in video format and it’s available here as PDF. To summarize, the thesis of Luma Partners’ people (that I agree 90%), it is that, because of ecosystem’s maturity, of the small number of players (comparatively to those over the internet), to the total transparency of the data feed, of standardization and of the simplicity of the buy-sell process and of the fact that major TV networks are pre-financed by the big advertisers, the moment when internet will “kill” linear TV is postponed. Indefinitely. Moreover, although – at least in US but the trend is noticeable also in other countries – the digital market increases in volume…TV doesn’t give up either. At all. What is clear for everyone is that the printed press is on a “death” path, while the (classical) radio doesn’t feel sensational either (but it is safer). A graphic with the historical evolution is available below. Here is why it is more probable for TV to “invade” the digital area than the other way, says Kawaja. I suspect him of a direct interest here, considering Luma makes its money from consultancy in mergers and acquisitions but, beyond anything, the guy has some very interesting arguments and data. In conclusion, the most probable, even if the TV content consumption pattern will radically change, those who will produce it and who will profit from the money to come from this source are still the players from today’s traditional TV. Or especially them. If you work in content, publishing, TV, digital…I recommend to spend 30 minutes during this week-end with the presentation above. « X reasons why Google decided to launch Alphabet	» The truth about fake news: how and why did we get here? Intr-adevar, se poate face lucruri mult, mult mai bune si mai practice folosind internetul decat televizorul, care necesita costuri imense. Totusi, probabil ca asta nu tine de producatori pe cat de mult si-ar dori ei asta. Internetul este mult mai usor de piratat, iar asta inseamna mai putini bani pentru ei in conditiile in care orice emisiune s-ar realiza exclusiv online. Probabil ca o sa se ajunga si la asta dar doar cand majoritatea oamenilor vor trece de la a urmari televizorul, la a urmari diverse lucruri pe net. Evident ca ei dupa nu o sa mai investeasca si astfel se va pierde. Sure, budgeting is a solid argument; but probably it’s the “path of least resistence” that keeps the TV alive. It’s much easier for average people to watch TV, than read an article/book/whatever over the Internet; this takes too much time and energy (for them). Marketers understand this and capitalize on it. people today tend to watch Youtube rather than TV.